Felicia Bond is an American writer and illustrator of numerous books for children. She is well known as the illustrator of all of the books in the "If You Give... Book" series, which are written by Laura Numeroff and published by HarperCollins Children's Books. 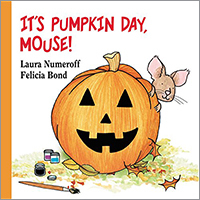 Join Mouse from If You Give a Mouse a Cookie as he decorates all the pumpkins in the patch in this sweet board book from Laura Numeroff and Felicia Bond. Mouse is excited for fall because that means it is time to decorate pumpkins! But one is missing. Where could it have gone? This is the perfect Halloween book for the very youngest reader, and is just the right book to get kids and budding artists inspired to work on their own Halloween crafts. Join Mouse from If You Give a Mouse a Cookie as he celebrates Valentine’s Day with all the friends he loves. 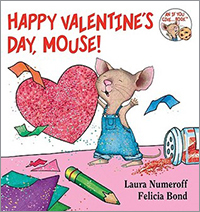 This boardbook with sturdy pages is perfect for preschoolers, who will enjoy the simple introduction to the fun of Valentine's Day.